Sunlight rakes across the controls in the cab of a locomotive. Train Simulator 2012 offers its most visible updates in the graphics department. 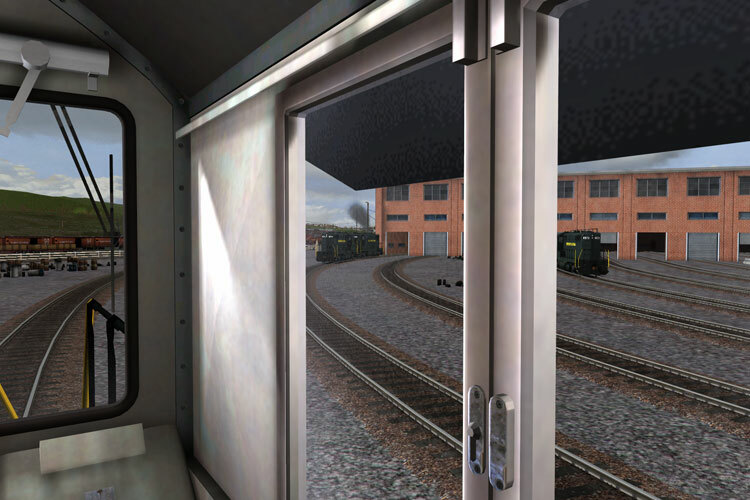 New graphical elements include a new lighting system, a new shadow system, and visual details like rain on locomotive windows. 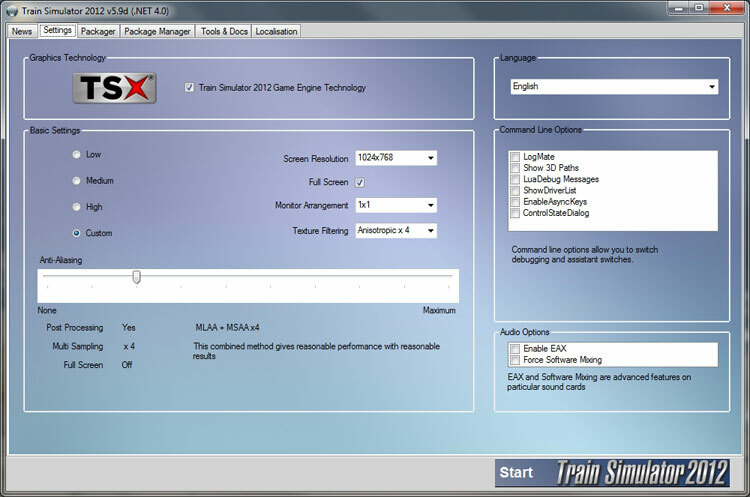 The options menu screen allows players to dial a variety of settings to the desired quality. Most of the new graphical features have variable levels of detail and some, such as the new shadows, can be disabled completely, rendering either no shadows or optionally “blobby” shadows. Other new graphical features, such as the rain on locomotive windows, appear to be fixed as I was not able to find a menu setting which disabled as effect. Also included in the graphical options are “HDR Bloom” and “Depth of Field” post processing effects. These behaved largely as expected based on experience with other games, and can be enabled separately as per the player’s tastes. Other technical updates include “super elevation” which is the term used to describe the vertical offset between inner and outer rails in a corner. This introduces a bit of “lean” to the locomotive, which is visible when rounding a corner. Inertial simulation of the driver within the cab is also a notable change from Railworks 2. This is a most easily described as a sort of “head bobble”, where corners, acceleration, and deceleration will shift the driver’s view around in a generally subtle way. Each of these will be looked at more closely later in this article. Other technical updates are included as well, some of which are not as obvious, or available within the editor. Since I am not skilled with the editor, I will not attempt to assess these items to avoid doing them an injustice. 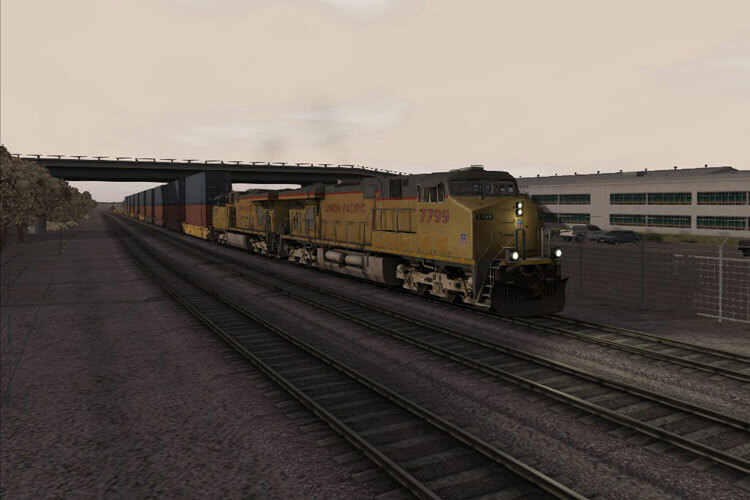 The core elements that I found enjoyable in Railworks 2 gameplay are still in place with Train Simulator 2012. Both the “Simple” and “Expert” control modes are still available for users who prefer one or the other. The “Drive by Train” and “Drive by Route” menus still have a familiar tabbed interface for selecting Standard, Career Mode, and Free roam scenario types. Interacting with the locomotives, rolling stock, and switches on the route is also familiar. As someone coming from Railworks 2 into Train Simulator 2012 on the same computer hardware, I was eager to see what kind of scalability the new graphics allowed. Happily the graphics options menu offers a decently wide range of settings for each of the options, some having more adjustable range than others. Being realistic about my budget gaming PC’s capabilities, and to keep a more fair comparison, I ran at 1024×768. Attempting to set 4xAA and 16xAF (as I had during my Railworks 2 review) within my graphics card driver software was not successful. 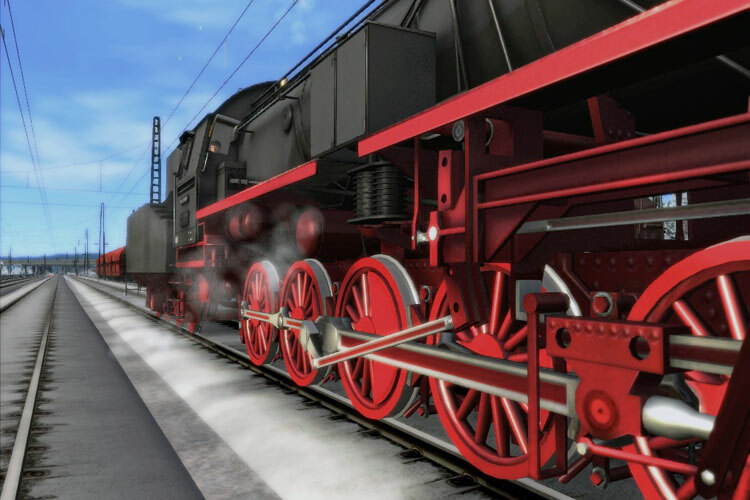 Once in game, there was no AA or AF being applied, and there were some odd visual artifacts, such as completely black skies or opaque black windows in the locomotive cabs. Using the “Settings” tab of the main Train Simulator 2012 application to choose “MLAA + MSAAx4” and “4x Anisotropic Filtering” gave a decent balance of image quality and acceptable performance on most routes at mostly “Medium” to “Low” custom graphics settings. More dense scenes were slightly slower, and with occasional pauses. Very dense scenes (see my separate segment on “The Horseshoe Curve”) were significantly slower. Disabling AA and AF did improve performance on these situations. All the screenshots illustrating this article use custom “Medium” to “Low” settings, “Highest” texture quality, and “MLAA + MSAAx4”. The software handles generally well, though I did experience a few minor issues. Firstly, I had two Steam related incidents. One of these items was a carryover from Railworks 2, being that I must run Steam in “Administrator” mode in order for Train Simulator 2012 to work. The other was a situation where attempting to start Train Simulator 2012 resulted in Steam returning an error that the game was “unavailable” and that I should try another time. My other Steam games still worked fine. Following the technical support pages at the Steam web site, I was able to solve this by deleting a large number of files from my Steam directory (the technical support page had extensive details on this process). This forced a rebuilt of the Steam client, and a short download for a handful of my Steam games (including the Train Simulator 2012 press sample). I have not experienced this issue again after the first fix. Once in game, occasionally Train Simulator 2012 would lock up while loading a scenario. A few times while trying to capture screenshots for this review using the Steam screenshot system, I also experienced lockups. Alt-Tabbing out then restarting Train Simulator 2012would fix this. Finally, the very first problem I had was the Train Simulator 2012 screen was not properly centered on my monitor, appearing offset beyond two edges. I checked and the refresh rate was above what my LCD monitor prefers (75Hz rather than 60Hz). Since there was no menu option to adjust refresh rate, I started searching the web for an answer, which I found entails editing a line in the “config.xml” file — an easy fix.